Cozy up in a super comfy pair of Ballerina Crochet Slippers. They’re a special treat for your feet that can’t be beat, and are so much fun to make. Check them all out now. 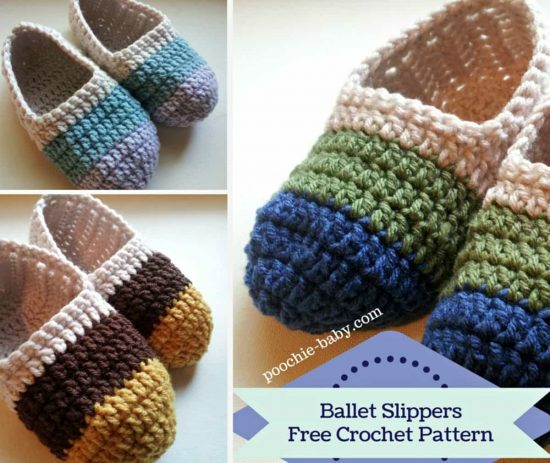 You’re going to love cozying up in a pair of these Ballerina Crochet Slippers and we’ve handpicked a number of gorgeous Free Patterns for you to choose from. There’s nothing better than a pair of comfy slippers that you can slide into at the end of the day and these are just so stylish. 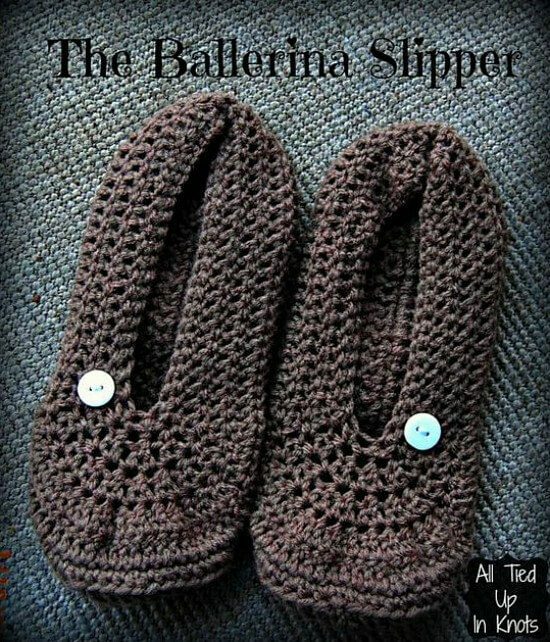 This pretty pair of Ballerina Crochet Slippers from Knot Your Nana’s Crochet are made with a lovely little granny square on top. 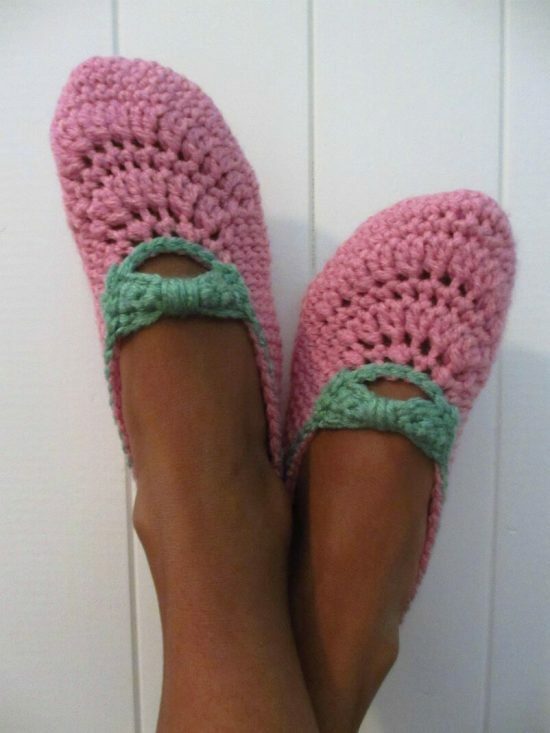 They’re a perfect traditional crochet look, and perfect slippers for summer. The pattern is written so that the size can be adjusted, no matter what you need to make. 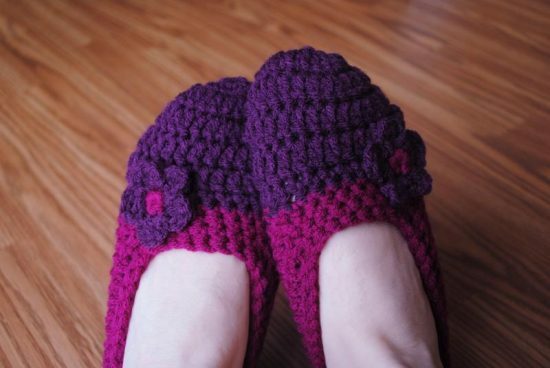 These crochet slippers have been one of the most popular slipper patterns on Ravelry for years. That’s because they’re so simple to make and look so cute when they’re done! You make them with simple stitches from the toe down to the heel, adding a strap and detailing afterward. This pattern from Nelly Handmade is one of our favorites! These slippers are soft and cozy and look stunning. You’ll feel like you’re wearing a trendy pair of flats when you slip these on at home. Adding a ribbon is optional and is a lovely finishing touch. They would make a great gift idea too. 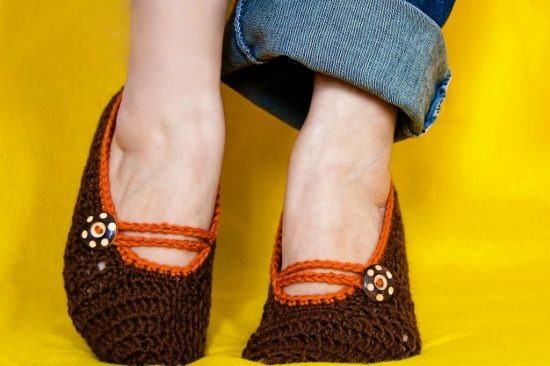 This lovely pair of slippers from Hodge Podge Crochet is a simple tutorial to follow, so you can make them in any shoe size you’d like. The stitching is lovely and the pattern is simple enough for a beginner to follow. You’ll be working in the round starting with the sole, crocheting up to the cuff. This pattern from Poochie Baby has more of a loafer look. They’ll keep your feet a little bit warmer too. You’ll be starting by making a round for the toes, then work your way to the heel in one piece. No complicated sewing is needed. The author also gives a lot of tips and tricks, as well as a more updated version showing you how to do them in more detail. A free pattern from Jay’s Boutique Blog, this pattern is made in a girl’s size 1.5. The blogger also gives instructions on how to adjust the sizing of the slippers. You’ll be making the sole first in a big round, then crochet up by reducing your stitches in each row. It’s really simple once you get the hang of it. We love everything about these beautiful Mary Jane Slippers from The Little House By The Sea. This blogger gives a great tutorial, making it simple for a beginner to follow along. The colors she uses are gorgeous. Of course, you can use any combination you like. They’re made to fit a UK shoe size 4-7 (5-7 1/2 in US sizes). This lovely pair of slippers is from Moogly Blog and Country Women’s Magazine. The pattern is free to download and fun to follow. It comes with instructions for two different sizes – women’s 4/5 and 6/7 US. These charming slippers are the perfect way to treat your feet at the end of the day. We love the flower, but you can choose to leave them plain or add your own special touch. The pattern is written for a women’s US size 7-8, but can easily be adjusted for shoe size. You’ll need to know how to crochet a magic circle – a technique used to make a closed crochet round.